Your stay at this Central Sarasota hotel places you within 3 miles (5 km) of Sarasota Jungle Gardens and John and Mable Ringling Museum of Art. Marietta Museum of Art and Whimsy and Ringling College of Art and Design are also within half a mile (1 km). This hotel features an outdoor pool and a fitness center. Business travelers can take advantage of the business center. Guests will appreciate freebies like continental breakfast and free self parking. Featuring conveniences like refrigerators and microwaves, the 102 guestrooms also offer free WiFi and flat-screen TVs with cable channels. Premium bedding, coffee/tea makers, and free local calls are also available. Location was good to Ringling Museum. Sub Way way next door. Thanks for your feedback! We're glad you enjoyed your stay with us. Thank you for the opportunity to respond to your concerns. We are very sorry to hear that your stay at the hotel was not up to par. We will share your review with our housekeeping staff to ensure improvements are made. We very much appreciate your business and thank you for staying with us. We would like to offer our sincerest apologies for the issues you encountered during your stay. Your feedback is extremely valuable to us, as we strive to improve with each and every stay. Thank you very much for bringing your concerns to our attention. Nice hotel...good location with short drive to amenities. Breakfast and rooms pleasant. A steal compared to downtown hotel prices. Thank you for choosing La Quinta Inns & Suites Sarasota for your recent stay. Your positive comments will be shared with our team, and we hope to see you next time you are in the area. The swimming pool was dirty and they hadn’t cleaned it for the 2 days we were there. I am sorry you had this experience. Currently the pool is being resurfaced and the steps are being replaced. I thank you for your comments. Very convenient location. Bed was very hard on my back. It pulled me down. I weigh 180 pounds. I am terribly sorry that you had this experience while staying with us. Thank you for your feedback. Very nice, clean room with great hospitality! This is a great place to bring your dog. We thank you for your feedback and are very pleased you enjoyed your stay with us. Bed bugs infestation! One of the worst hotel stays of my life. Pros: The location was easy access to where I needed to be in Sarasota. I had a pretty view of water from my window. WAS better than 2 other hotels in area. Cons: Re-connect the central air that was available in the room-based on visual of old thermostat so all of room and bathroom could have air conditioning. Location: A large-chain grocery store is nearby as is a beach with parking. Purchased a suite/upgrade to do some work and not have to do it in the BED. The adjacent room w/ sofa and desk did not have air conditioning except what came through the door opening from the bedroom. HUGE DISAPPOINTMENT. I had no creamer, sugar, stirs for the coffee in the room.The sign-in staff acted like I was bothering them to check in. My check OUT person was very friendly with a smile. Free continental breakfast takes some patience as the area is small with many people. Thanks for your feedback about our La Quinta Inn & Suites Sarasota. We’re sorry the hotel didn’t meet your expectations. We’ll share your comments with our staff so that we may improve our operation and prevent similar situations from happening to other travelers. We appreciate you sharing your feedback with our team. We hope you’ll once again choose La Quinta Inns & Suites for your lodging needs. Location: It is a block from a park that was nice for walking our dogs and fishing. We needed a room for 2 nights before we could check into our room on lido beach for the week. I would have stayed here the whole time as nice as it was. But we wanted on the beach. We had two large dogs with us and the place was very pet friendly. But you couldn't tell from the looks of it. It was very clean and luxurious for a pet friendly hotel. They had grass areas around their lot with post that had doggie bags and trash cans available. The rooms were very nice and comfortable and had nice appliances in them. The bathrooms were very clean. everything worked properly and felt new. Their breakfast was very nice. Waffles, bagels, fruit, eggs, ect. The building had a lot of nice amenities but we did not use any of them even though they looked very nice and clean. I did find two small items of trash in our room the last day while picking up our dogs toys. One under the bed skirt and one under the loveseat. Nothing bad just missed by cleaning. There is a nice park a block down the road as well that we walked our dogs in every morning. Very nice hotel and I would definitely stay there again. We stayed in one on our way to Sarasota and stayed in one on our way back home at the end of the week. All were very nice and clean with great breakfast. Thanks for the positive feedback! It’s great to know your stay with us at La Quinta Inn & Suites Sarasota Downtown was as good as we had hoped it would be. We’re looking forward to having you again as our guests! 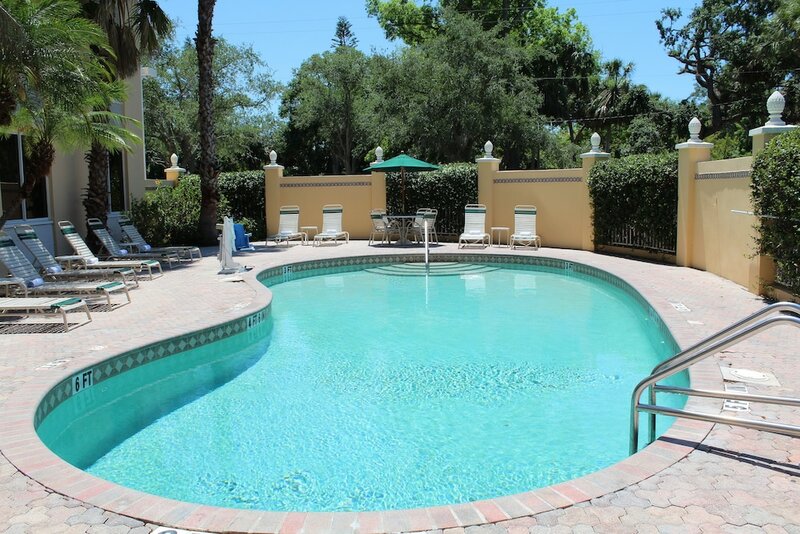 La Quinta by Wyndham Sarasota Downtown offers its guests an outdoor pool and a fitness center. There's an onsite business center. Free breakfast is served. The business-friendly La Quinta by Wyndham Sarasota Downtown also features coffee/tea in a common area, laundry facilities, and express check-out. Self parking is free. This Sarasota hotel is smoke free. La Quinta by Wyndham Sarasota Downtown offers 102 air-conditioned accommodations with coffee/tea makers and hair dryers. Beds feature premium bedding. Flat-screen televisions come with premium cable channels. Refrigerators and microwaves are provided. Bathrooms include showers and complimentary toiletries. Guests can surf the web using the complimentary wireless Internet access. Business-friendly amenities include desks along with free local calls (restrictions may apply). Housekeeping is provided daily.